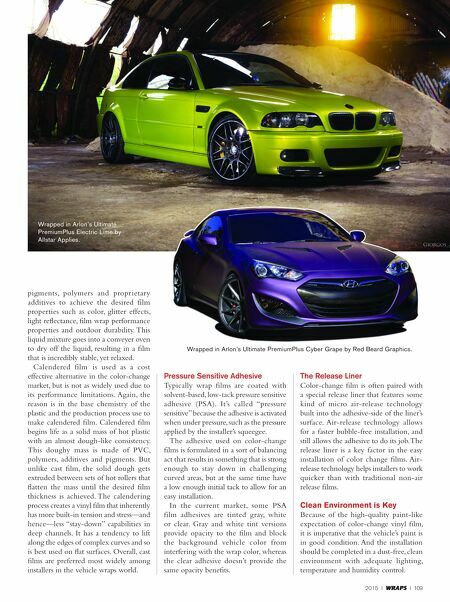 2015 I WRAPS I 109 pigments, polymers and proprietary additives to achieve the desired film properties such as color, glitter effects, light reflectance, film wrap performance properties and outdoor durability. This liquid mixture goes into a conveyer oven to dry off the liquid, resulting in a film that is incredibly stable, yet relaxed. Calendered film is used as a cost effective alternative in the color-change market, but is not as widely used due to its performance limitations. Again, the reason is in the base chemistry of the plastic and the production process use to make calendered film. Calendered film begins life as a solid mass of hot plastic with an almost dough-like consistency. This doughy mass is made of PVC, polymers, additives and pigments. But unlike cast film, the solid dough gets extruded between sets of hot rollers that flatten the mass until the desired film thickness is achieved. The calendering process creates a vinyl film that inherently has more built-in tension and stress—and hence—less "stay-down" capabilities in deep channels. It has a tendency to lift along the edges of complex curves and so is best used on flat surfaces. Overall, cast films are preferred most widely among installers in the vehicle wraps world. Pressure Sensitive adhesive Typically wrap films are coated with solvent-based, low-tack pressure sensitive adhesive (PSA). It's called "pressure sensitive" because the adhesive is activated when under pressure, such as the pressure applied by the installer's squeegee. The adhesive used on color-change films is formulated in a sort of balancing act that results in something that is strong enough to stay down in challenging curved areas, but at the same time have a low enough initial tack to allow for an easy installation. In the current market, some PSA film adhesives are tinted gray, white or clear. Gray and white tint versions provide opacity to the film and block the background vehicle color from interfering with the wrap color, whereas the clear adhesive doesn't provide the same opacity benefits. The release liner Color-change film is often paired with a special release liner that features some kind of micro air-release technology built into the adhesive-side of the liner's surface. Air-release technology allows for a faster bubble-free installation, and still allows the adhesive to do its job. 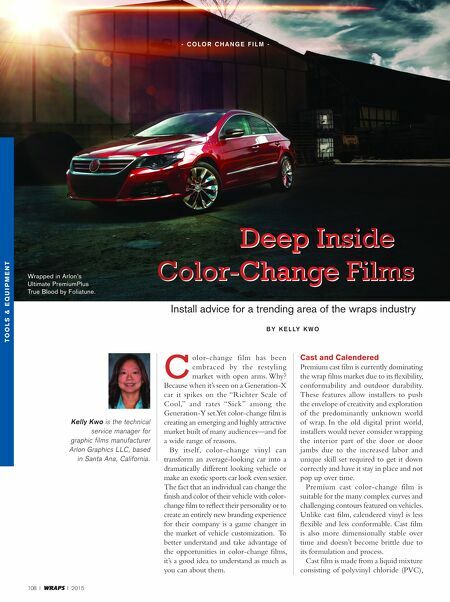 The release liner is a key factor in the easy installation of color change films. Air- release technology helps installers to work quicker than with traditional non-air release films. Clean Environment is Key Because of the high-quality paint-like expectation of color-change vinyl film, it is imperative that the vehicle's paint is in good condition. And the installation should be completed in a dust-free, clean environment with adequate lighting, temperature and humidity control. Wrapped in Arlon's Ultimate PremiumPlus Cyber Grape by Red Beard Graphics. Wrapped in Arlon's Ultimate PremiumPlus Electric Lime by Allstar Applies.